2017 is upon us, bringing with it a flurry of new top-end smartphones to get excited about. The tenth anniversary of the original iPhone means Apple may have something special in store for us this year, while Samsung will probably come out all guns blazing in order to soundly recover from the Galaxy Note 7 debacle. 2017 will be the year of the tenth anniversary of the original iPhone, the smartphone that upended and revolutionised the whole mobile phone industry. So it is no surprise that all eyes are on Apple and what it does to commemorate the occasion. And, of course, hopes are high that iPhone 8 will bring a number of changes to the table, enough to make up for the iterative updates we have had over the past two years. Leaks point to three different versions of iPhone 8: one featuring all the new features, and the other two being the successors of iPhone 7 and iPhone 7 Plus, with only a few upgrades. Apple is reportedly developing more than 10 iPhone 8 prototypes, and working on a “radical redesign” of the smartphone. Rumour has it that at least the top-end version of the iPhone 8 will not have the Home button; instead, the Touch ID fingerprint sensor and the front camera will be integrated into the touchscreen. Apple is also said to be testing flexible OLED panels for the iPhone 8. Wireless charging is widely expected to be integrated in iPhone 8, along with iris or facial scanning. iPhone 8 is said to be powered by the A11 chip manufactured on the 10nm process, the glass body will reportedly make a comeback. The top-end iPhone 8 model will reportedly also have optical image stabilisation in both cameras on the back, which may be vertically aligned rather than horizontally. The screen size of this new top-end smartphone is not yet known, though the tech grapevine pegs it anywhere between 4.7-inches and 5.8-inches. 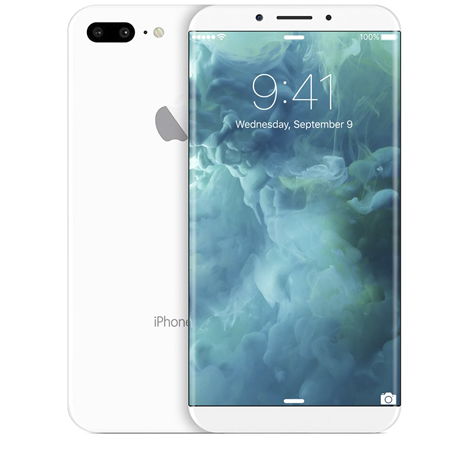 The wait for iPhone 8 will be long, of course, as the next Apple flagship smartphone is likely to be unveiled only in September next year. Galaxy S8 will have the burden of expectations as it is Samsung’s first flagship smartphone to be launched after the Galaxy Note 7. Samsung has confirmed that the Galaxy S8 will have an Artificial Intelligence-powered virtual assistant, and a great camera. Rumours say Galaxy S8 will not have an earphone jack, or Home button – instead, it is said to come with wireless earphones, and feature optical fingerprint sensor that will be embedded in the touchscreen. Reportedly, the Galaxy S8 smartphone will have a 4K display with ultra-thin bezels, dual 13-megapixel and 9-megapixel cameras on the back, fingerprint sensor on the back, USB Type-C port, selfie camera with autofocus and VR support. A recent report suggests that the smartphone may feature a massive 8GB of RAM, along with faster UFS 2.1 storage. Rumours also say that the Samsung Galaxy S8 may not feature any physical keys in the front, and pack two variants of the Exynos 8895 chipset. Samsung was earlier rumoured to be planning to launch the Galaxy S8 at the Mobile World Congress in late February, but a new report says that the company has delayed the unveiling till April. Apparently, the South Korean titan will focus on regaining consumer confidence in the time till April. Samsung Galaxy S8 may cost 15-20 percent more than its predecessor. The AI-based virtual assistant will apparently be integrated with apps that come preloaded on the smartphone. A ‘Plus’ variant of Samsung Galaxy S8 featuring a 6-inch display, and support for the S-Pen stylus may also be in the works.